Paradise, but in the city! 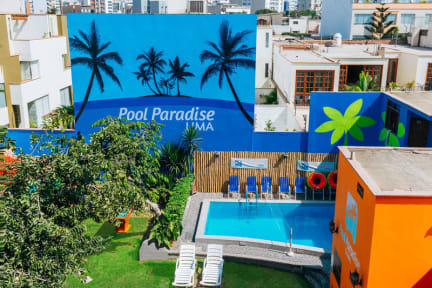 Pool Paradise Lima is the only hostel in the safe tourist district of Miraflores with an outdoor pool! Book now and enjoy the summer in Lima with us! As well as our very own outdoor pool, huge garden, and BBQ area, we have a breakfast area, an onsite food and drinks menu, travel agency , free internet access, Common/TV areas, even a Bar where you can try Peru's famous Pisco! Not to mention our daytime and night events such as our popular cooking classes and BBQ night. Pool Paradise Lima is conveniently located in an ideal spot to unwind yet enjoy the cities´ most vibrant attractions within the heart of Miraflores. Perfectly located a short walk away from Kennedy Park, the stunning coastline, Lima's famous culinary scene, cultural sights, shops and bars. We are Just 1 block away from the Metropolitan bus stop going to the historical centre and a short walk away from the nearest official Airport Express Bus Stop. What do you get at Pool Paradise Lima? Our luggage storage is available 24/7 and completely free. Leave your bags and jump in the pool! We have onsite staff who can help with planning your visit in Lima or even around Peru. All the best tips and discounts available. We will show you all the must see spots in Lima and give recommendations on restaurants/bars/places to visit during your stay. Enjoy a spot of TV, watch your favourite sports team play or catch a movie. In all ensuite rooms around the clock. Available to store all your valuables, securely. Complete with patio tables and chairs for relaxing and soaking up the sun. For residents with Happy Hour drinks specials and classic Peruvian cocktails you must try! If you need to purchase tickets, tours and a whole lot more. Offering you cheap food and beverage options without having to leave the hostel. Daily meal deals and drinks specials. Such as FREE walking tours, cooking classes, BBQ events and much more. Payment upon arrival by credit cards, debit cards. This property might pre-authorize your credit card. For no shows you will be charged your first night. I stayed there for 1 day and had an amazing time! Staff was so nice and helpful, and the cleaning ladies were so sweet! It’s located in the safe area of Miraflores and 15 mins away from the center – in a quiet residential area, so we could get a rest. Bar was cool and they maintain the place quiet after midnight. Hot water at will. I really liked the pool and the open garden, and everywhere was quite clean. Definitely good value for money! Thank you guys! Very Nice place. Lovely pool, good atmosphere, the breakfast is good and the rooms are fine too. The staff is very sweet and helpful! The location is perfect :-) Would Without doubt recommend this place. Super friendly staff, good to socialize, and pool was a BIG PLUS! They have a travel agency right in the lobby and a big bar which closes early enough to get good sleep in quiet. I think that the mattresses were new and I really loved the individual curtains with the inbuilt power sockets and the reading light. Overall very clean the hostel. Would definitely come back! The nicest and most helpful staff that we’ve seen in a long time. Nice pool area. Staff were super friendly and welcoming, and eager to help out. Breakfast included which is always good. Being a bit of a party hostel it seemed busy at the bar at night but then super quiet and weird atmosphere during the day, and the pool looked dirty which is the primary reason we booked here, so we weren’t keen to hang out and stay another night. Bunks and bathrooms were clean and there are lockers in rooms. A ten min walk to the best bar/restaurant areas so location not bad.